Choose a window decal style, with the adhesive on the front, for mounting the decal on the inside of a window. Choose a label style, with the adhesive on the back, for mounting on a wall, counter, or other flat surface. 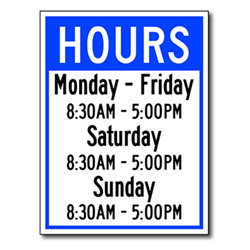 Use this Business Hours window decal or label in your retail store, restaurant, or other place of business to let visitors know your hours of operation.